Digital audio broadcasting (DAB) is a digital radio standard for broadcasting digital audio radio services, used in many countries around the world, though not North America. DAB is generally more efficient in its use of spectrum than analogue FM radio, and thus can offer more radio services for the same given bandwidth. However the sound quality can be noticeably inferior if the bit-rate allocated to each audio program is not sufficient. DAB is more robust with regard to noise and multipath fading for mobile listening, although DAB reception quality degrades rapidly when the signal strength falls below a critical threshold, whereas FM reception quality degrades slowly with the decreasing signal, providing effective coverage over a larger area. The original version of DAB used the MP2 audio codec. An upgraded version of the system was released in February 2007, called DAB+, which uses the HE-AAC v2 audio codec. DAB is not forward compatible with DAB+, which means that DAB-only receivers are not able to receive DAB+ broadcasts. However, broadcasters can mix DAB and DAB+ programs inside the same transmission and so make a progressive transition to DAB+. DAB+ is approximately twice as efficient as DAB, and more robust. As of 2018, 41 countries are running DAB services. The majority of these services are using DAB+, with only Ireland, UK, New Zealand, Romania and Brunei still using a significant number of DAB services. See Countries using DAB/DMB. In many countries, it is expected that existing FM services will switch over to DAB+. Norway is the first country to implement a national FM radio analog switchoff, in 2017, however that only applied to national broadcasters, not local ones. DAB has been under development since 1981 at the Institut für Rundfunktechnik (IRT). The first DAB demonstrations were held in 1985 at the WARC-ORB in Geneva, and in 1988 the first DAB transmissions were made in Germany. Later, DAB was developed as a research project for the European Union (EUREKA), which started in 1987 on initiative by a consortium formed in 1986. The MPEG-1 Audio Layer II ("MP2") codec was created as part of the EU147 project. DAB was the first standard based on orthogonal frequency division multiplexing (OFDM) modulation technique, which since then has become one of the most popular transmission schemes for modern wideband digital communication systems. In October 2005, the World DMB Forum instructed its Technical Committee to carry out the work needed to adopt the AAC+ audio codec and stronger error correction coding. This work led to the launch of the DAB+ system. By 2006, 500 million people worldwide were in the coverage area of DAB broadcasts, although by this time sales of receivers had only taken off in the United Kingdom (UK) and Denmark. In 2006 there were approximately 1,000 DAB stations in operation worldwide. As of 2018, over 68 million devices have been sold worldwide, and over 2,270 DAB services are on air. DAB uses a wide-bandwidth broadcast technology and typically spectra have been allocated for it in Band III (174–240 MHz) and L band (1.452–1.492 GHz), although the scheme allows for operation between 30 and 300 MHz. The US military has reserved L-Band in the USA only, blocking its use for other purposes in America, and the United States has reached an agreement with Canada to restrict L-Band DAB to terrestrial broadcast to avoid interference. DAB historically had a number of country specific transmission modes (I, II, III and IV). In January 2017, an updated DAB specification (2.1.1) removed Modes II, III and IV, leaving only Mode I.
DAB uses the MPEG-1 Audio Layer II audio codec, which is often referred to as MP2 because of the ubiquitous MP3 (MPEG-1 Audio Layer III). The newer DAB+ standard adopted the HE-AAC version 2 audio codec, commonly known as 'AAC+' or 'aacPlus'. AAC+ is approximately three times more efficient than MP2, which means that broadcasters using DAB+ are able to provide far higher audio quality or far more stations than they could with DAB, or a combination of both higher audio quality and more stations. One of the most important decisions regarding the design of a digital radio broadcasting system is the choice of which audio codec to use, because the efficiency of the audio codec determines how many radio stations can be carried on a fixed capacity multiplex at a given level of audio quality. The DAB+ standard incorporates Reed-Solomon ECC as an "inner layer" of coding that is placed around the byte interleaved audio frame but inside the "outer layer" of convolutional coding used by the original DAB system, although on DAB+ the convolutional coding uses equal error protection (EEP) rather than UEP since each bit is equally important in DAB+. This combination of Reed-Solomon coding as the inner layer of coding, followed by an outer layer of convolutional coding – so-called "concatenated coding" – became a popular ECC scheme in the 1990s, and NASA adopted it for its deep-space missions. One slight difference between the concatenated coding used by the DAB+ system and that used on most other systems is that it uses a rectangular byte interleaver rather than Forney interleaving in order to provide a greater interleaver depth, which increases the distance over which error bursts will be spread out in the bit-stream, which in turn will allow the Reed-Solomon error decoder to correct a higher proportion of errors. The ECC used on DAB+ is far stronger than is used on DAB, which, with all else being equal (i.e., if the transmission powers remained the same), would translate into people who currently experience reception difficulties on DAB receiving a much more robust signal with DAB+ transmissions. It also has a far steeper "digital cliff", and listening tests have shown that people prefer this when the signal strength is low compared to the shallower digital cliff on DAB. Using values for Transmission Mode I (TM I), the OFDM modulation consists of 1,536 subcarriers that are transmitted in parallel. The useful part of the OFDM symbol period is 1 millisecond, which results in the OFDM subcarriers each having a bandwidth of 1 kHz due to the inverse relationship between these two parameters, and the overall OFDM channel bandwidth is 1,537 kHz. The OFDM guard interval for TM I is 246 microseconds, which means that the overall OFDM symbol duration is 1.246 milliseconds. The guard interval duration also determines the maximum separation between transmitters that are part of the same single-frequency network (SFN), which is approximately 74 km for TM I. The term "DAB" most commonly refers both to a specific DAB standard using the MP2 audio codec, but can sometimes refer to a whole family of DAB-related standards, such as DAB+, DMB and DAB-IP. As DAB is not forward compatible with DAB+, older DAB receivers cannot receive DAB+ broadcasts. However, DAB receivers that will be able to receive the new DAB+ standard via a firmware upgrade went on sale in July 2007. If a receiver is DAB+ compatible, there will be a sign on the product packaging. DAB+ broadcasts have launched in several countries like Australia, Czech Republic, Denmark, Germany, Hong Kong (now terminated), Italy, Malta, Norway, Poland, Switzerland, Belgium (October 2017), the United Kingdom and the Netherlands. Malta was the first country to launch DAB+ in Europe. Several other countries are also expected to launch DAB+ broadcasts over the next few years, such as Austria, Hungary, Thailand, Vietnam and Indonesia. South Africa began a DAB+ technical pilot in November 2014 on channel 13F in Band 3. If DAB+ stations launch in established DAB countries, they can transmit alongside existing DAB stations that use the older MPEG-1 Audio Layer II audio format, and most existing DAB stations are expected to continue broadcasting until the vast majority of receivers support DAB+. Ofcom in the UK published a consultation for a new national multiplex containing a mix of DAB and DAB+ services, with the intention of moving all services to DAB+ in the long term. In February 2016, the new national network Sound Digital launched with three DAB+ stations. As of 2017, DMB is currently broadcast in Norway, South Korea and Thailand. More than 40 countries provide DAB, DAB+ or DMB broadcasts, either as a permanent technology or as test transmissions. DAB is not used in the United States. The United States' FCC argues that stations on such a national DAB Band would be more difficult to control from signal interference than AM/FM/TV because of the continent's large land mass; and corporations who sell DAB radio in North America could find it more expensive to market these types of radio to consumers. There are no DAB radio stations that operate in North America as of 2018. Some countries have implemented Eureka-147 digital audio broadcasting (DAB). DAB broadcasts a single multiplex that is approximately 1,500 kilohertz wide (~1,000 kilobits per second). That multiplex is then subdivided into multiple digital streams of between 9 and 12 programs. In contrast, FM HD Radio adds its digital carriers to the traditional 270 kilohertz-wide analog channels, with capability of up to 300 kbit/s per station (pure digital mode). The full bandwidth of the hybrid mode approaches 400kHz. The first generation DAB uses the MPEG-1 Audio Layer II (MP2) audio codec, which has less efficient compression than newer codecs. The typical bitrate for DAB stereo programs is only 128 kbit/s or less, and as a result, most radio stations on DAB have a lower sound quality than FM, prompting a number of complaints among the audiophile community. As with DAB+ or T-DMB in Europe, FM HD Radio uses a codec based upon the MPEG-4 HE-AAC standard. DAB can give substantially higher spectral efficiency, measured in programmes per MHz and per transmitter site, than analogue systems. In many places, this has led to an increase in the number of stations available to listeners, especially outside of the major urban areas. Numerical example: Analog FM requires 0.2 MHz per programme. The frequency reuse factor in most countries is approximately 15 for stereo transmissions (with lesser factors for mono FM networks), meaning (in the case of stereo FM) that only one out of 15 transmitter sites can use the same channel frequency without problems with co-channel interference, i.e. cross-talk. Assuming a total availability of 102 FM channels at a bandwidth of 0.2MHz over the Band II spectrum of 87.5 to 108.0 MHz, an average of 102/15 = 6.8 radio channels are possible on each transmitter site (plus lower-power local transmitters causing less interference). This results in a system spectral efficiency of 1 / 15 / (0.2 MHz) = 0.30 programmes/transmitter/MHz. DAB with 192 kbit/s codec requires 1.536 MHz * 192 kbit/s / 1,136 kbit/s = 0.26 MHz per audio programme. The frequency reuse factor for local programmes and multi-frequency broadcasting networks (MFN) is typically 4 or 5, resulting in 1 / 4 / (0.26 MHz) = 0.96 programmes/transmitter/MHz. This is 3.2 times as efficient as analog FM for local stations. For single frequency network (SFN) transmission, for example of national programmes, the channel re-use factor is 1, resulting in 1/1/0.25 MHz = 3.85 programmes/transmitter/MHz, which is 12.7 times as efficient as FM for national and regional networks. The original objectives of converting to digital transmission were to enable higher fidelity, more stations and more resistance to noise, co-channel interference and multipath than in analogue FM radio. However, many countries in implementing DAB on stereo radio stations use compression to such a degree that it produces lower sound quality than that received from FM broadcasts. This is because of the bit rate levels being too low for the MPEG Layer 2 audio codec to provide high fidelity audio quality. Despite the above, a survey in 2007 of DAB listeners (including mobile) has shown most find DAB to have equal or better sound quality than FM. DAB devices perform band-scans over the entire frequency range, presenting all stations from a single list for the user to select from. DAB can carry "radiotext" (in DAB terminology, Dynamic Label Segment, or DLS) from the station giving real-time information such as song titles, music type and news or traffic updates, of up to 128 characters in length. This is similar to a feature of FM RDS, which enables a radiotext of up to 64 characters. The DAB transmission contains a local time of day and so a device may use this to automatically correct its internal clock when travelling between time zones and when changing to or from Daylight Saving. DAB is not more bandwidth efficient than analogue measured in programmes per MHz of a specific transmitter (the so-called link spectral efficiency), but it is less susceptible to co-channel interference (cross talk), which makes it possible to reduce the reuse distance, i.e. use the same radio frequency channel more densely. The system spectral efficiency (the average number of radio programmes per MHz and transmitter) is a factor three more efficient than analogue FM for local radio stations. For national and regional radio networks, the efficiency is improved by more than an order of magnitude due to the use of SFNs. In that case, adjacent transmitters use the same frequency. Also, as DAB transmits digital audio, there is no hiss with a weak signal, which can happen on FM. However, radios in the fringe of a DAB signal, can experience a "bubbling mud" sound interrupting the audio or the audio cutting out altogether. The specialised nature, limited spectrum and higher cost of DAB broadcasting equipment provides barriers to unlicensed ("pirate") stations broadcasting on DAB. In cities such as London with large numbers of unlicensed radio stations broadcasting on FM, this means that some stations can be reliably received via DAB in areas where they are regularly difficult or impossible to receive on FM because of interference from unlicensed radio stations. However, this led to the situation where some stations are being broadcast in mono; see music radio stations broadcasting in mono for more details. DAB transmitters are inevitably more expensive than their FM counterparts. DAB uses higher frequencies than FM and therefore there may be a need to compensate with more transmitters to achieve the same coverage as a single FM transmitter. DAB is commonly transmitted by a different company from the broadcaster who then sells the capacity to a number of radio stations. This shared cost can work out cheaper than operating an individual FM transmitter. This efficiency originates from the ability a DAB network has in broadcasting more channels per transmitter/network. One network can broadcast 6–10 channels (with MP2 audio codec) or 10–18 channels (with HE AAC codec). Hence, it is thought that the replacement of FM-radios and FM-transmitters with new DAB-radios and DAB-transmitters will not cost any more compared with new FM facilities. It is also argued that the power consumption will be lower for stations transmitted on a single DAB multiplex compared with individual analog transmitters. Once applied, one operator has claimed that DAB transmission is as low as one-nineteenth of the cost of FM transmission. The reception quality during the early stage of deployment of DAB was poor even for people who live well within the coverage area. The reason for this is that DAB uses weak error correction coding, so that when there are a lot of errors with the received data not enough of the errors can be corrected and a "bubbling mud" sound occurs. In some cases a complete loss of signal can happen. This situation has been improved upon in the newer DAB+ version that uses stronger error correction coding and as additional transmitters are built. As with other digital systems, when the signal is weak or suffers severe interference, it will not work at all. DAB reception may also be a problem for receivers when the wanted signal is adjacent to a stronger one. This was a particular issue for early and low cost receivers. Minimizing the bit-rate, to the lowest level of sound-quality that listeners are willing to tolerate, such as 112 kbit/s for stereo and even 48 kbit/s for mono speech radio (LBC 1152 and the Voice of Russia are examples). 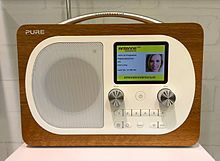 Listeners using a combination of analogue (AM or FM) and DAB radios (e.g. in different rooms of a house) will hear a mixture when both receivers are within earshot. Time signals, on the contrary, are not a problem in a well-defined network with a fixed delay. The DAB multiplexer adds the proper offset to the distributed time information. The time information is also independent from the (possibly varying) audio decoding delay in receivers since the time is not embedded inside the audio frames. This means that built in clocks in receivers can be precisely correct. DAB can provide savings for networks of several stations. The original development of DAB was driven by national network operators with a number of channels to transmit from multiple sites. However, for individual stations such as small community or local stations which traditionally operate their own FM transmitter on their own building the cost of DAB transmission will be much higher than analog. Operating a DAB transmitter for a single station is not an efficient use of spectrum or power. Although FM coverage still exceeds DAB coverage in most countries implementing any kind of DAB services, a number of countries moving to digital switchover have undergone significant DAB network rollouts. In 2006 tests began using the much improved HE-AAC codec for DAB+. Hardly any of the receivers made before 2008 support the newer codec, however, making them partially obsolete once DAB+ broadcasts begin and completely obsolete once all MP2 encoded stations are gone. Most new receivers are both DAB and DAB+ compatible; however, the issue is exacerbated by some manufacturers disabling the DAB+ features on otherwise compatible radios to save on licensing fees when sold in countries without current DAB+ broadcasts. Portable DAB/DAB+ and FM receiver, circa 2016. This unit requires two "AA" size batteries. (Headphones not shown). As DAB requires digital signal processing techniques to convert from the received digitally encoded signal to the analogue audio content, the complexity of the electronic circuitry required to do this is higher. This translates into needing more power to effect this conversion than compared to an analogue FM to audio conversion, meaning that portable receiving equipment will have a much shorter battery life, and require higher power (and hence more bulk). This means that they use more energy than analogue Band II VHF receivers. However, thanks to increased integration (radio-on-chip), DAB receiver power usage has been reduced dramatically, making portable receivers far more usable. Norway was the first country to announce a complete switch-off of national FM radio stations. The switch-off started on 11 January 2017 and ended on 13 December 2017. The 2017 switch-off did not affect some local and regional radio stations. They can continue to transmit on FM until 2022. Sweden in 2015 suspended its plans to switch off. Italy, RAS planned the switchover in the province of Trentino between December 2017 and November 2018, a national switchover isn't planned..
Denmark in 2018 decided not to switch off FM transmitters. Switzerland announced its plans for a progressive digital switchover between 2020 and 2024. Whilst many counties have expected a shift to digital audio broadcasting, a few have moved in the opposite direction following unsuccessful trials. Canada conducted trials of DAB in L-band in major cities. However the success of satellite digital radio and lack of L-band DAB receivers led to the analogue switch-off being abandoned. Canada subsequently adopted HD Radio as used in the neighboring United States instead of DAB. Hong Kong announced the termination of DAB in March 2017. Portugal announced the termination of DAB in April 2011. ^ "DAB Eureka-147: a European vision for digital radio". sagepub.com. ^ "St.meld. nr. 30 (2006-2007)". Regjeringen.no. ^ a b "WorldDAB DAB Global Summary" (PDF). worlddab.org. 2018-08-29. ^ a b "Worlddab.org" (PDF). Archived from the original (PDF) on 2007-11-28. Retrieved 2007-11-17. ^ "Settings and stations". dab-digitalradio.ch. ^ Group, Andy Finney ATSF for the Digital TV. "DTG :: News :: DAB Radio launches 18 new stations with Government support". Archived from the original on 2016-03-18. Retrieved 2016-03-26. ^ Holm, Sverre (2007). "Lydkvalitetet i DAB digitalradio". Digitale Utgivelser ved UiO. Archived from the original on 2008-05-01. Retrieved 2009-01-03. (Norwegian). ^ a b "BBC R&D White Paper WHP 061 June 2003, DAB:An introduction to the EUREKA DAB System and a guide to how it works" (PDF). BBC.co.uk. Retrieved 2007-05-08. ^ James Welsh. "Ofcom reveals DAB sound quality opinions". Digital Spy. ^ Garfors, Gunnar. "DAB 20 Times Greener Than FM". Archived from the original on 13 October 2016. Retrieved 21 June 2012. ^ "WorldDAB Q2 2018 Infographic" (PDF). www.worlddab.org. 2018-11-28. Retrieved 2018-12-21. ^ "Slik slukkes FM-nettet". NRK. ^ "Regeringen stoppar övergången till DAB-radio". ^ "Digitalradio weiter ausgebaut – UKW Abschaltplan der RAS von der Landesregierung genehmigt" (in German). 14 November 2017. ^ "Global Summary" (PDF). WorldDAB. 29 July 2016. WorldDAB, the global industry forum for digital radio. Neutral facts of DAB, Neutral facts of DAB - where the lobby organisations like World Dab and others do not control the information.